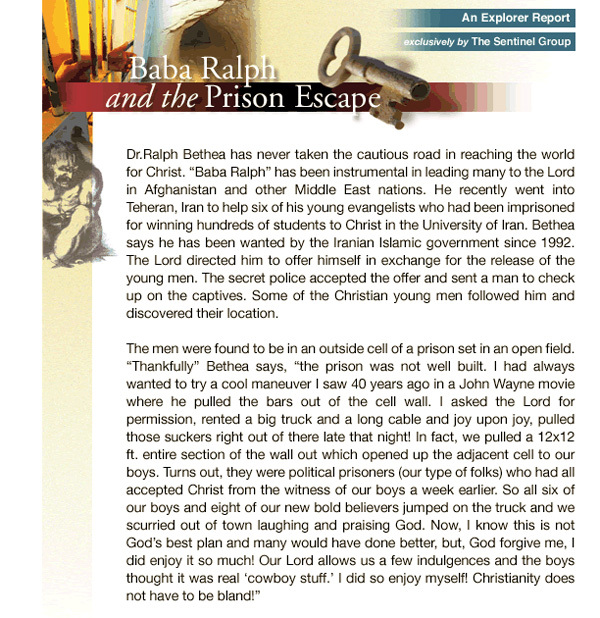 Let me start you off with a brief, exciting story about a jailbreak in Iran that beats anything Hollywood will do this year. And it's all true! Read about it here. Now, that was just a quick peek at the human drama and divine power you never hear about - despite the millions of noisy words pouring out of the media on Iraq, Iran and the Islamic menace. Last week I took my wife and kids to see the Egyptian premiere of "Narnia" in Cairo. The film was as wonderful as we had hoped. But I must confess that far more interesting to me than watching digital lions and beavers come to life was being in a theater jam-packed with Muslims mesmerized by a thinly-veiled parable of Jesus Christ, penned by one of the 20th century's greatest Christian writers. Every seat was taken, and when we left, the theater's lobby could not contain all those hoping to get into the 10 o'clock show. The same was true in the spring of 2003 when ... Muslims packed movie theaters throughout the Middle East to see Mel Gibson's "The Passion of the Christ". They were watching Jesus teach. They were watching Him suffer and die and rise again. They were crying - sobbing, in many cases - as they continued to flood the theaters night after night. Doesn't sound much like the Muslim jihadists you see in the liberal media, does it? Those media know what sells papers and draws viewers: Conflict. Scandals. Outrage. Violence. Hatred. Head-on collisions between groups and nations. Anything else may get short shrift. For instance, did the liberal media tell you about the Reconciliation Walk? From 1996-1999, teams of Christians trekked along the same route that the Crusaders did 900 years before - from Cologne, Germany, to Jerusalem. About 2,000 marchers, cycling in and out, visited Muslim and Jewish villages and cities. And as they went, they wore T-shirts proclaiming in Arabic or Hebrew, "I apologize" and called out, "We're sorry". Astonished Muslims poured out of their homes and into the streets, many of them applauding and cheering wildly, some of them weeping. The marchers were hugged warmly and invited in for dinner. City mayors welcomed them with heartfelt, emotional speeches. That beats bullets six ways to Sunday. But now it's all gone and forgotten, buried under millions of conflict-promoting words. Iraq: More than 5,000 new Muslim converts to Christianity have been identified since the end of major combat operations. 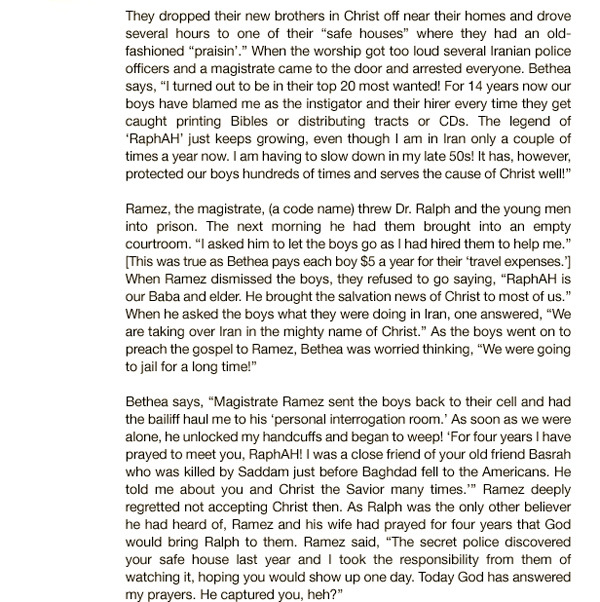 ... Also, more than 1 million Bibles [were] shipped into the country since 2003, and pastors report Iraqis are snatching them up so fast they constantly need more Bibles. Afghanistan: only 17 Muslim converts to Christianity before 9/11/01, but now more than 10,000. 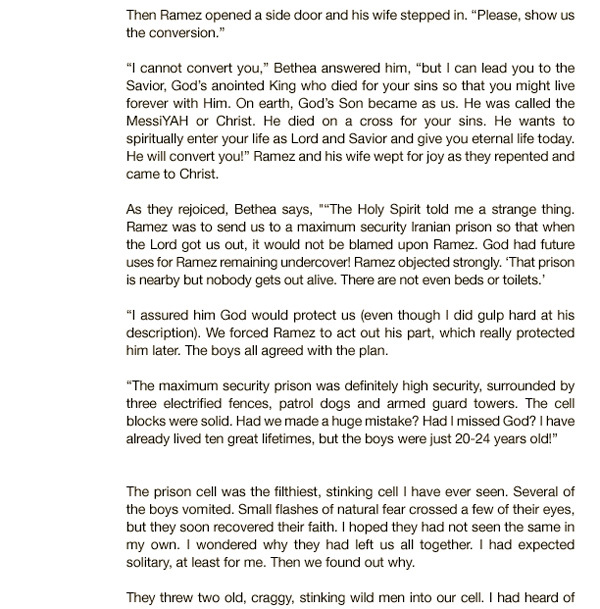 Kazakstan: only three known Christians in 1990, but now more than 15,000. Uzbekistan: no known Christians in 1990, but now more than 30,000. 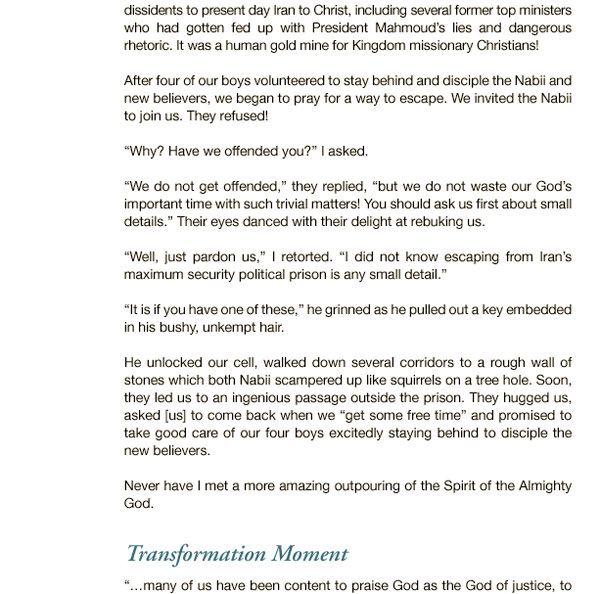 Iran: In 1979, there were only 500 known Muslim converts to Christianity, but today Iranian pastors and evangelical leaders tell me there are more than 1 million Iranian believers in Jesus Christ, most of whom meet in underground house churches. Sudan: More than 1 million Sudanese have converted to Christianity just since 2000, and some 5 million have become Christians since the early 1990s, despite a radical Islamic regime and an ongoing genocide. ... Why such a dramatic spiritual awakening? "People have seen real Islam, and they want Jesus instead", one Sudanese evangelical leader told me. Egypt: Some reports say 1 million Egyptians have trusted Christ over the past decade or so. 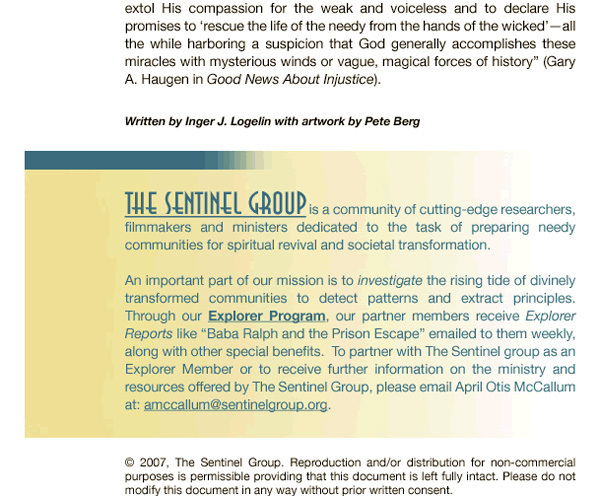 The Egyptian Bible Society told me they used to sell about 3,000 copies of the JESUS film a year in the early 1990s. But last year they sold 600,000 copies, plus 750,000 copies of the Bible on tape. The shocker is that 600,000 figure. Each circulating copy of JESUS in the Mideast will, on average, draw about 4.1 Muslims into a saving relationship with Christ. Do the math! I think our troops are winning, but I know Jesus is winning. Here is another article on this topic, along with a video. 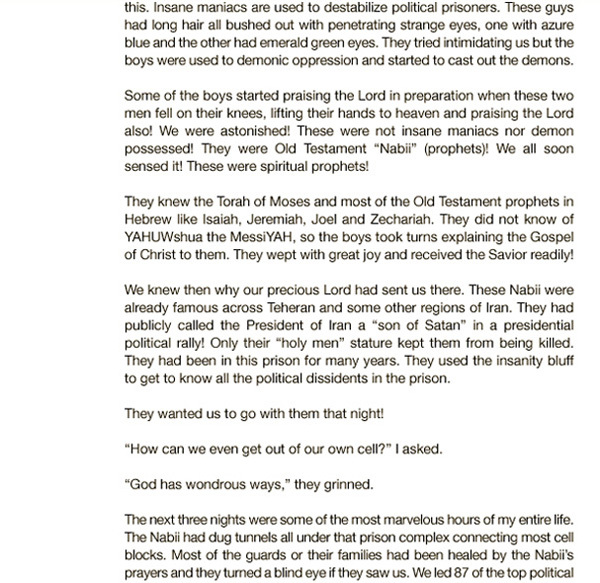 Here is a website that features a lot of Muslims who became born-again Christians.